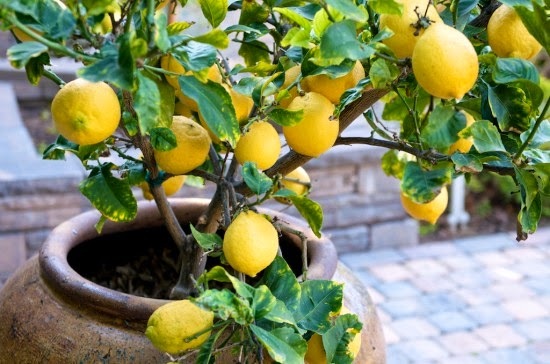 Lemons trees are one of the most coveted of all the fruit trees and while they may be expensive to purchase they are relatively simple to propagate from. The easiest way to produce your own lemon tree is to grow one from seed but there is a problem with this. Lemon trees grown from seed do not grow true to the parent plant. However there is a technique where you can produce a genetically identical plant, and that is by taking cuttings. Before you start make sure that you have some rooting hormone powder handy. The best time of year to take cuttings from lemon trees is anytime between April and September. It is best to plant up any cuttings as soon as possible so before taking your cutting prepare your pots first. Wash your pots out with hot soapy water and rinse thoroughly before drying. Fill the pots to within an inch of the top with a good quality compost such as John Innes 'Seed and Cuttings', or you can make your own mix using one part perlite and one part peat, or one part peat and one part coarse river sand. Water well and allow the water to drain from the pot. Select a young branch of new wood that does not have any fruit or flowers. The stem should be round healthy, pest and disease free. Using a sterilized knife or secateurs make a 8-10 inches long cut just below a leaf node. You can identify new wood by its lack of bark and green stem color. Remove any lateral stems and leaves except for those near the apical tip. The leaves that are remain will then need to be cut in half to reduce transpiration. Dip the cut end into the powdered rooting hormone, then shake off excess hormone. Do not push the cutting directly into the compost, instead stick a pencil in first to create a hole. This helps to prevent the rooting hormone from being wiped off the end of the cutting. Place the cutting inside a heated propagator and set the temperature to 18-20 degrees Celsius or cover the cutting with a clear polythene bag, of the bottom half of a clear plastic drinks bottle. Place the cuttings on a warm bright windowsill but out of direct sun. Regularly mist the cutting with water to maintain high humidity and gently water the compost if it begins to dry out. Just make sure that the compost is not waterlogged. The roots should form and extend into the compost in 3-4 weeks, to check if rooting has occurred gently tug on the cutting to see if it is stable within the pot. If it is then rooting has occurred and the plants can be removed from the propagator or have their covers taken off. keep them on the warm bright windowsill or move to a cool greenhouse for a couple more weeks as they establish in the pot. If they are kept in the greenhouse then shading may need to be provided. Before being placed outside the young plants will need to be hardened off for a week or so otherwise the leaves will be scorched in the direct sun. Keep the cutting in a pot for the first year, repotting as necessary. In Mediterranean climates they can be planted directly outside in a sunny position. In colder countries they will need to be kept in pots outside and brought in under protection over the winter.